DeeDee, born December 31, 2018. On the last day of 2018, a doll named DeeDee was born. Making a Waldorf doll is a true labor of love and the process has taken me anywhere from six months to sixty minutes, depending on the complexity of the doll and the deadline! I don’t consider myself an advanced sewist or an expert in doll making, but the beauty of the Waldorf doll is that it meets you where you are. If you have patience and a basic understanding of hand-sewing (machine-sewing is a bonus) you should be able to craft a Waldorf doll. Both of my daughters have received a full-sized Waldorf doll on the Christmas before their third birthdays. This post is nowhere near a comprehensive assessment of the available Waldorf doll making resources, it’s merely the best resources I have used to make my dolls. I would also like to point out that my knowledge of the Waldorf philosophy is not extensive and my experiences with the “pure” version of the Waldorf method have been mixed. Because of the racist views of the founder of Waldorf education, Rudolf Steiner, I think it’s important to think critically about the elements of the Waldorf philosophy that I choose to adopt in my home. Waldorf dolls are a valuable addition to our home because of their size, materials, and construction methods. Typically these dolls are stuffed with wool, an antibacterial natural resource that lends weight and a scent memory to your doll. By scent memory, I mean that as your child spends time with the doll, the wool will take on the scent of your child and your home, making it an even more treasured comfort item (Fig & Me has a lovely blog post about why wool is the best choice for stuffing a Waldorf-inspired doll) As far as I know, synthetic stuffing materials do not perform in quite the same way. The doll’s skin is made from a cotton knit (I always choose to make mine from heavy duty cotton knit because, well, kids) and I always choose wool (either yarn or roving) for the hair. I have only purchased supplies for my dolls while living in Germany, so I don’t have a company to recommend to U.S. based readers, but there are several to choose from. While you can make a doll from any materials, I really believe that trying to mostly use doll making supplies for Waldorf dolls makes a difference. The clothes are perhaps my favorite bit. I choose to reclaim old clothes, knit sweaters, and re-purpose old baby clothes for my dolls. I’ve used clothing patterns from Kinderbonnets on Etsy, which have been lovely and simple (her shop appears to be on a break until Summer 2019). For sweaters I really this pattern from Bamboletta Dolls (their blog is a treasure trove of wonderful tutorials). The book where I get my patterns from is Making Waldorf Dolls by Maricristin Sealey. (I believe this is the same book). There are so many patterns available online, but I wanted to make dolls that were traditional and therefore (usually) more simple to construct. Again, there are so many options available and I do look forward to trying some other modern patterns someday. I’ve watched countless YouTube videos on creating the head for a Waldorf doll (arguably one of the most technically challenging bits) but this tutorial from Faith & String was very helpful. After my first doll, I decided to try doing some needle felting on the cheeks (inspired by the absolutely breathtaking Waldorf-inspired dolls made by Fig & Me). The needle felting was a lot of trial and error, but I’m really pleased with how it’s turned out on my most recent doll, DeeDee. For DeeDee’s hair, I used this tutorial from Bamboletta Dolls and chose an appropriate yarn length and volume based on the size of my doll. There’s a huge difference in skills between my first doll, Lisa, and my most recent. I was worried that my oldest would be jealous of my youngest for having a doll that is so much bigger and more skillfully sewn, but I didn’t need to worry. Lisa (my first doll) is a possession prized above all others, and that makes my heart happy. I’ve made two “full-sized” Waldorf dolls and countless miniature ones, but I think my most cuddly dolls were the fairies I made from a recycled cashmere sweater and roving scraps for Christmas 2017. In a flurry of thread and wool, I made those dolls in about an hour on Christmas Eve, after everyone had gone to bed! 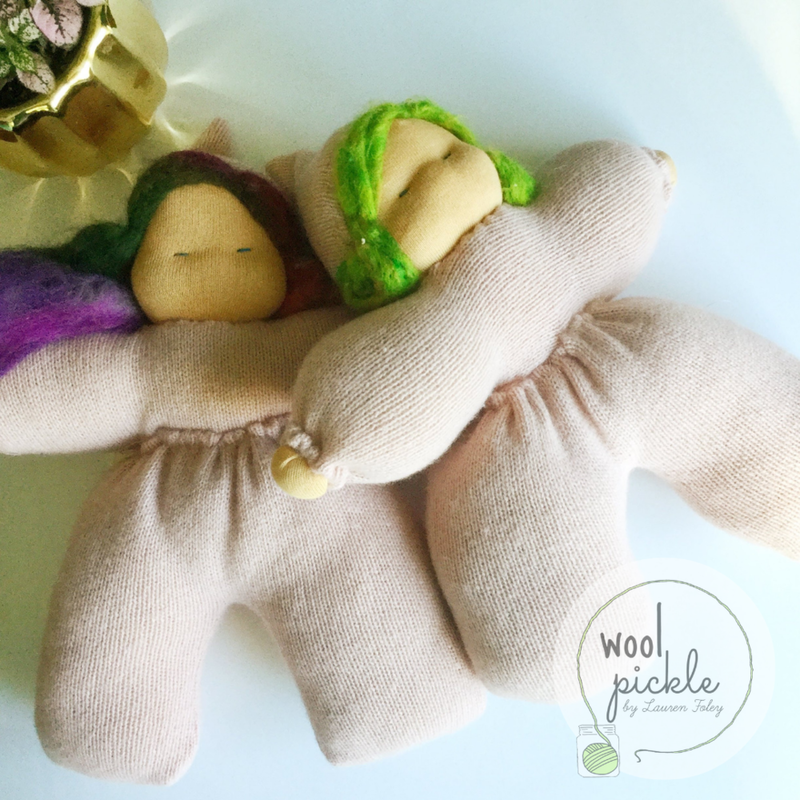 Wool felt wings and recycled cashmere from a sweater make these dolls special. 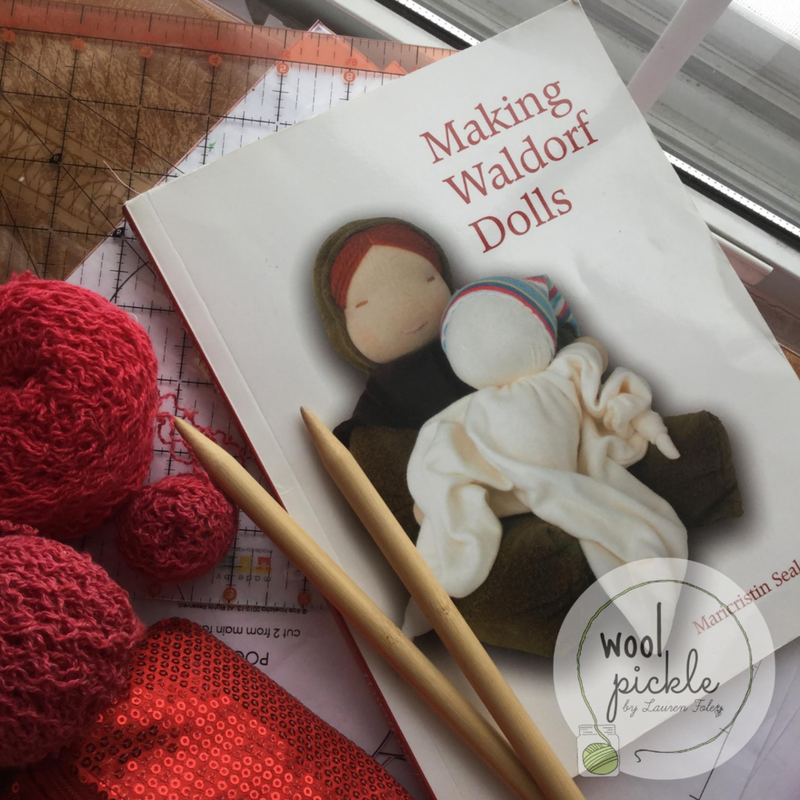 I hope that if you’re considering making a Waldorf-inspired doll that this has helped you find some resources and inspired you to be creative. Happy crafting! Dear goodness gracious, it has been far, far too long since I last visited this space. What a collection of months it has been, though. My family has packed up and left Germany, spent months visiting family, driven halfway across the country, and settled in a home we can call our own. It's been an adventure, a whirlwind, a flurry of emotion and change. Much as with Netflix marathons in my life before kids, I've recently found myself grabbing ropes of wool and saying, "Just one more handful and then I'll do the dishes." I think it's probably uneccessary to point out, but my house is a complete disaster right now. It's okay, though. I've just checked out "The Life Changing Art of Tidying Up" from the library for the fourth time and I really think it'll do the trick this time.